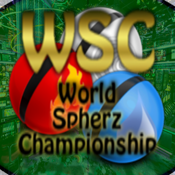 World Championship Spherz is a brand new concept inspired from poker. Six players at the table gambling their spherz, where the winner is the last to have spherz in hand. Thinking and strategy are needed to win the trophies of the 15 gambling halls around the world. Each player puts a Spherz of his choice. In case of a tie, each opponent loses his Spherz. When a player has no Spherz he's eliminated.